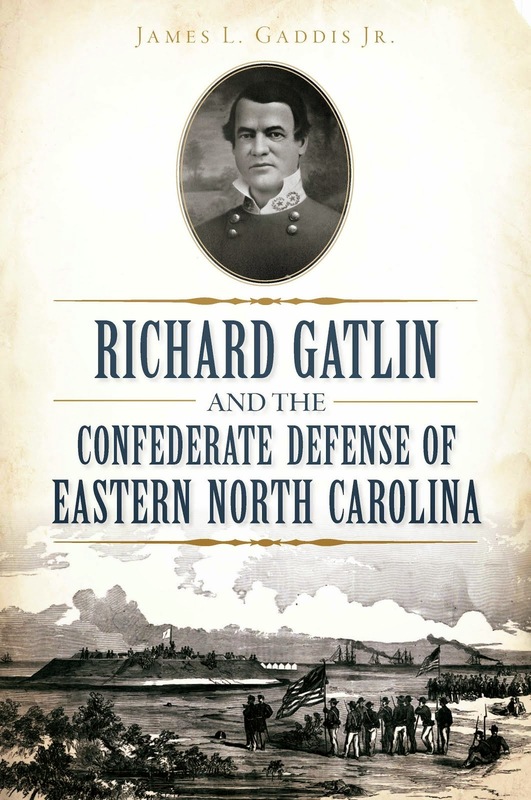 My book, Richard Gatlin and the Confederate Defense of Eastern North Carolina, was released on March 23, 2015, a little over a week ago. As far as I can tell, book sales are satisfyingly strong. I've sold 27 copies myself from my small cache. I can't tell how many copies have been sold on amazon.com or on barnesandnoble.com but, even though it has fallen back now, at one point early on it ranked around number 124,000 on Amazon in overall sales and 15th in the category of Civil War - Confederate. On Barnes and Noble it has consistently ranked between 450,000 and 550,000. I don't really know what any of those numbers mean in terms of actual sales, however. At any rate, I have heard from a handful of folks who have read it and let me know about it that it is a good, easy-flowing read. They seem to universally relate to and sympathize with General Gatlin too. I am looking forward to the appearance of the Kindle and Nook versions online, but don't know how soon that will be. I learned yesterday that there is only one copy in the Barnes and Noble store in Greenville, NC but that they have eight more copies on order for arrival this week. I have seen online ads for the book also from Target, Wal-Mart, and Sam's Club. Apparently, they either will carry it or sell it online. This book is not a novel folks, but a biography and non-fiction historical account of Gatlin's life and his command of the North Carolina Department early in the Civil War. I strongly urge each and everyone to go ahead and get a copy, read it, even if you're not a Civil War buff (it's not just a Civil War book), and leave a review out on Amazon or Barnes and Noble. Or just post your thoughts on this blog page in the comments somewhere. If you want a signed copy, email me, then send $20 bucks, and I will get one into the mail (foreign delivery extra). Thanks to each and everyone who has bought, will buy, and has read or will read my work. Can America run out of money? No. Can Americans run out of money? Yes. Let's examine these two seemingly contradictory assertions. First, America, that is, the United States government, cannot run out of money because it actually creates money by spending. You see, US dollars are essentially federal government IOUs. Dollars are created when the federal government issues checks or makes electronic payments and the recipient's bank increases the balance in the recipient's account by the amount of the payment. At that point of balance increase, and not before, money is created in the US economy. If nothing else, the US government is authorized by the Constitution to spend. Of course, Congress could theoretically put an end to federal spending through legislation. That legislation might end government spending, but, it technically would not end the government's ability to spend. Thus, the federal government, which does not need to have money in order to spend money, can never run out of money. What about the federal "debt" you say? Well, decades ago Congress enacted an arbitrary law that requires the US Treasury to sell Treasury securities in an amount equal to the difference between federal spending and federal tax collections. Get that? Spending does not follow Treasury security sales. Rather, Treasury security sales follow the amount of federal spending and tax collections. The federal "debt" that everyone complains about is the amount of outstanding Treasury securities, not some amount of money the federal government had to borrow to pay for its spending. The "debt ceiling" is a limit on Treasury sales, not a limit on federal spending per se. Now, on to the second assertion - Americans can run out of money. Money is created in two ways: 1) through bank lending, and 2) federal spending. In both cases, the private sector, of which the American people, households, businesses, and local and State governments are a part, are the recipients of this newly created money. With bank lending, however, the borrower incurs a responsibility to pay the money back. When he borrows $1000 from the bank he must pay it back, with interest. Consequently, if money came only from bank lending there would be no net money in play except for loan defaults. A growing money supply would necessarily be only the flip side of a growing private sector debt load. In aggregation, the private sector cannot, has not, and will never be able to create a positive net amount of money. If it had to depend on itself, the private sector would always stay in the hole to the tune of interest amounts. On the other hand, when the federal government spends into the private sector (all its spending goes into the private sector by definition) there is no requirement that that money be repaid to the federal government. However, there is a little thing called federal taxes. The money paid to the federal government in the form of taxes simply reduces the net amount of money the federal government has injected into the private sector via its spending. If the federal government were to tax back exactly as much as it spends, then there would be no net money flowing to the private sector and the private sector would eventually run out of money, and be unable to save a dime or pay interest on any private borrowing. Oh, by the way, that situation where the federal government taxes back every dollar it spends, thus depriving the private sector of any net money flow, is known as "The Balanced Budget". Good thing we don't have a Constitutional requirement to balance the budget, huh? Hear me Oh Tea Party, Libertarian Party, Republican Party, and even Democrat Party!!! Okay. Now that the publication date of March 23,2015 has come, book sales are officially under way. I can't tell how many copies have been sold on amazon.com and Barnes and Noble, but I had an impromptu book signing at the Kinston Civil War Round Table meeting tonight and sold my first 15 copies. Gatlin's story wraps itself around many of the major events of the 19th century and I really want it to get out there into the reading public. I'll bet you did not know, for example, that as a new West Point graduate in 1832 Gatlin and several of his newly graduated classmates volunteered to join General Winfield Scott on the first Great Lakes military steamboat armada, from Buffalo, NY to Fort Dearborn, IL, to fight in the Black Hawk War. Unfortunately, a deadly cholera outbreak short-circuited the voyage, several hundred soldiers died, and the West Pointers returned to Buffalo having faced the army's greatest enemy - disease. That was the first, but not the last time that Gatlin would come face to face with death and win. His family was not so lucky however. Check out Richard Gatlin and the Confederate Defense of Eastern North Carolina. It's not just a Civil War book. Chew on this if you truly think there is a problem with having a federal debt of $18.5 trillion. The danger of a large debt is that the debtor could go insolvent, that is, unable to pay the debt. Well that problem was resolved for the federal government in 1971 when the US went completely to a fiat monetary system. That means that the US can create as much money as it wants without fear of running short (as long as it maintains a floating exchange rate and all its debts are in US dollars). Or to put it another way, the US is free to create any amount of money to repay any debt, no matter how large - it can never come up short of money. But a closer look reveals something else about the nature of the federal debt that should make us welcome it rather than fear it. Here is what you are probably not going to understand unless you really think hard about it - the federal debt is actually money itself. When we talk about federal "debt", we are actually talking about the net amount of money the federal government has spent. Think about this: a US dollar is a federal "debt" to the holder of that dollar. When you and I have debt, it refers to dollars we have borrowed, either physically or on credit. We actually owe those dollars. When the federal government has debt, it refers to the net dollars it has spent. Big difference! Let me reiterate: your debt is dollars you owe. Federal debt is dollars it has spent. You repay debt by giving up dollars. The federal government repays its debt by taking back dollars. Because US dollars are federal debt and federal debt is US dollars, eliminating or reducing the federal debt means reducing or eliminating the number of dollars in circulation. Could you get along with a lot less money? Not likely. But the US government can because it can create money at will. Therefore, it never has to reduce its "debt". So don't hate the federal debt. Be glad of it. That leads to one more thought. Federal taxes - you know, those horrible obligations that take money from us - are the federal government's way of reneging on its debt to us. Branch and Anderson Led Brigades - Why Not Gatlin? Brigadier General Richard C. Gatlin was commander of the Confederate North Carolina Department from August 19, 1861 to March 15, 1862. In 1862, he had two subordinate generals, Brigadier General Lawrence O'Bryan Branch in New Bern and Brigadier General Joseph R. Anderson in Wilmington. Due to a sudden recurrence of an old case of malaria, Gatlin was unable to assume the field command from his subordinate, Branch, when the Union's Burnside Expedition attacked New Bern on March 14, 1862. The Confederate forces retreated, New Bern fell, Branch was the losing general, and Gatlin was stripped of his command by the Confederate War Department, officially due to his illness. A mystery I have been struggling with for years is why Gatlin never received another Confederate command. This seems very odd to me because among North Carolina-born Confederate officers, Gatlin, a 29-year veteran, was the third most experienced former officer of the US army, trailing only Generals Gabriel Rains and T. H. Holmes. Holmes was a division commander in Virginia and Raines led a brigade there. Holmes, in fact, replaced Gatlin on March 25, 1862 as commander of the North Carolina Department. Holmes' new organization consisted of four brigades, two of which were commanded by none other than Generals Joseph R. Anderson and Lawrence O'B. Branch, Gatlin's recent subordinates. Anderson and Branch were strictly civilian generals, neither had extensive military experience prior to the war, although Anderson was a West Point graduate. Further, less experienced officers such as Dorsey Pender and Matt Ransom became brigade commanders during Gatlin's hiatus. After recovering from his illness, in April 1862, Gatlin petitioned the War Department for a brigade command, offering himself for field service, but a new command never came. April faded to May then June and on into the fall, yet Gatlin sat on the sidelines, living at his sister's home in Everettesville near Goldsboro. By October 1862, Gatlin began campaigning for the North Carolina Adjutant General's post. Confederate regulations forbade a brigadier general from holding his commission for longer than a specified period, I believe six months, without actively commanding a brigade. Still, Gatlin held onto his commission until January 1863 when, following personal meetings in Richmond with War Secretary James Seddon, he resigned his commission retroactively to September 8, 1862. So why, in an army that desperately needed experienced generals, did civilians Branch and Anderson actively command brigades while the old pro Gatlin sat on the sidelines? In the absence of evidence to the contrary, I can only speculate with three plausible explanations. The first is that Gatlin, in his frustrating seven-month battle with the Confederate War Department for troops and ordnance that never materialized, must have kindled the ire of the War Department. On several occasions, he expressed his displeasure and disgust with the Confederacy's failure to adequately arm his North Carolina Department. The second is that Gatlin was persona non grata in North Carolina following the loss of New Bern. The press had excoriated him (unfairly) and Gatlin was, at least in 1862, a political liability. The third, and most plausible, is that Gatlin refused to serve outside of North Carolina. Any brigade commander would have been expected to lead his troops in Virginia or Tennessee or elsewhere, yet some reports indicate that Gatlin professed loyalty to only his home state and refused to serve outside its borders. I have not seen the Confederate War Department records, or Secretary Seddon's papers, which could reveal his discussions with Gatlin, so on my agenda is a trip to the National Archives this summer to examine those records for the answer, or at least a clue. By the way, Branch was killed at Sharpsburg in September 1862. His command went on to become the much-heralded Branch-Lane brigade. Anderson was wounded at Frayser's Farm in June 1862 and resigned his commission to resume his management of the Tredegar Iron Works in Richmond. Chances are good that Gatlin, had he gained a brigade command, might have been killed or wounded as well. Or perhaps he would have become one of Lee's trusted generals - we'll never know of course. If you order my new book before March 23 you can get it at the discounted pre-publication price. Check it out at Barnes and Noble or Amazon right now! Federal Debt? No, Not Really. All six of these presumptions are tragically wrong, of course, but how could you know that with the press, many economists, and especially the lunatics in Congress and on the campaign trail pounding these threats into you? The $18+ trillion "debt" is not a credit card bill run up by a free-spending Congress, it is nothing more than the sum of dollars that people, companies, and countries currently own in Treasury security investments housed in the Federal Reserve. The US has not "borrowed" this money, at least not in the consumer sense. Investors have saved it by having bought Treasury securities which are a virtually risk-free investment offered by the US Treasury. You may even have some US Savings Bonds of your own. The Treasury has not spent that money - it creates new money whenever it spends. Rather, the Treasury simply parks investors' dollars until the securities expire then it transfers the balances from the depositors' securities accounts back to their checking accounts and adds a little interest. Often it rolls the amounts into new securities because the depositors do not want to cash in their securities. The Treasury rolls over some $70 trillion per year, four times the current balance. Thus, the federal "debt" can be described more accurately as private sector savings. The Treasury sells securities in an amount up to what it has spent above its tax collections or up to the so-called "debt limit" whichever comes first. Why? Not because it needs the money (it doesn't even spend tax dollars - those are destroyed), but because Congress back in 1917 decreed that it must. The mandate to sell Treasury securities is a remnant of the by-gone gold standard days when the US had to make sure it did not create more money than it had gold to back it up. Those days disappeared in 1971, freeing the US to create as much money as Congress wants to authorize, not just up to the amount of gold it can buy. Because the federal debt (more aptly called "federal savings") is nothing but Treasury security balances, it is sustainable to whatever amount dollar investors want it to be. There is never a reason to "pay off" the federal debt. The investors who own that debt do not want it paid off. They would have to find other, less safe, investment vehicles if the US paid off and quit selling Treasury securities. Because the Treasury rolls over T-securities, or redeems them via accounting transfers, taxes do not pay for them. Our grandchildren will suffer only if we eliminate the private sector investment. The dollar remains strong partially because there is a virtually risk free place to park private sector dollar surpluses. If Congress were to cap the amount of Treasury security savings with a hard and fast debt limit, then the private sector would lose one of its best investment opportunities. So, don't be afraid of the misnamed federal debt. It is one of private sector America's chief assets regardless of what President Obama, Rand Paul, or Paul Ryan tell you. 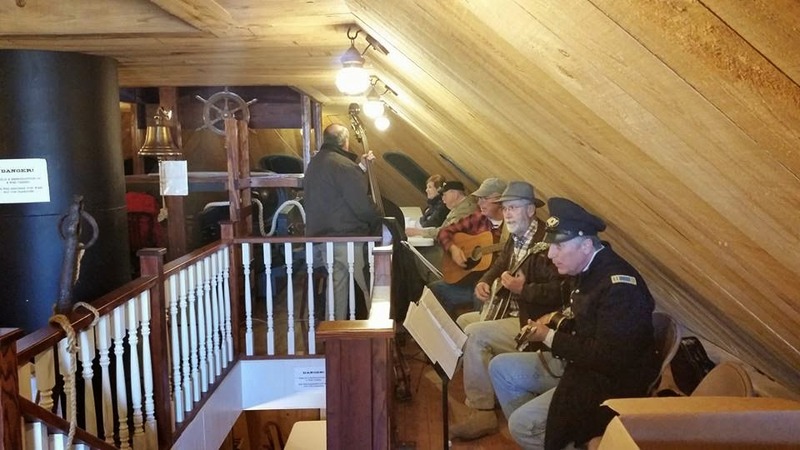 We, meaning The Farm and Home Band and Mike Parker, played another fun gig this morning on the CSS Neuse II gunboat for the "Breakfast on the Boat" fundraiser. It was 29 degrees when we started playing about 8:00 A.M. which, if you play music you know, was quite a challenge for our fingers. I was warmly clad though in my replica 1840s US Infantry Officer's uniform that, thankfully, for once, is all heavy wool. The CSS Neuse II is a full-size replica of the Confederate ironclad, the CSS Neuse that was completed, launched, and scuttled here in Kinston a century and a half ago. Building a full-size replica of Kinston's locally famous Civil War icon was a brainstorm of the late Ted Sampley and was accomplished over several years by local volunteers who learned the hard way to become shipbuilders. With the remains of the original CSS Neuse now safely housed in Kinston's new Civil War Interpretive Center and the CSS Neuse II one block away on a large, dedicated downtown lot, Kinston is becoming quite the Civil War tourist destination. After "Breakfast on the Boat" we went over to see the dedication ceremony of the aforementioned Civil War Interpretive Center. Later we took a great three-hour bus tour of the Wyse Fork Civil War Battlefield just east of Kinston. There were good crowds at all three events despite the cold morning. As is so often is the case in Kinston, the weather changed and the temp skyrocketed to a sunny low 60s. Since I started my research for the soon-to-be-published biography of Kinston-native General Richard Caswell Gatlin (1809-1896), one question keeps popping up from interested parties: "Was he the guy that invented the gun? ", meaning the Gatling Gun? The answer is "No, he is not the guy". Oddly enough, however, the Gatling Gun was invented by another North Carolinian, one Richard Jordan Gatling of Gates County who is no relation to the subject of my research and book. By the way, I heard from my publisher this week that the projected March 23 publish date is still good, that the books are printed and in the warehouse, and that they will be shipped to the various booksellers around March 18. The original publish date was supposed to be February 7 but from what I've heard of publishers' experiences, a one and a half month delay is not bad at all. As a reminder, the book, Richard Gatlin and the Confederate Defense of Eastern North Carolina is already available online at a pre-publication discount from Barnes and Noble and Amazon. Admittedly, a biography of R. C. Gatlin may not be on everyone's radar, but I'm pretty sure, when you read it, that you will find Gatlin's journey through the 19th century to be quite a story. Oh the horror of it all! Standard mantra is that the US government borrows money, lots of money, from China. China forgodssake! Candidate Obama said as much in his 2008 campaign and guys like Limbaugh, Hannity, and virtually every presidential candidate, people who should know better, repeat it. Why shouldn't we believe it? The US has to get its money from somewhere besides taxes doesn't it? We should not believe it because it just is not true - at all! The United States does not borrow money from China, or from anybody else. The United States creates new money every time it spends. A country that creates its own money has no need to borrow its own money from someone else. So why does this myth persist you might wonder? I think it persists for two reasons. First, most people assume the US government is just like a business or household that must live within its means or go bust. Businesses and households rely on revenues or incomes. If they spend more than they take in, they often borrow to cover the difference. The federal government, however, is far different. With its ability to issue dollars it does not rely on or even use revenue at all (although politicians wrongly call taxes "revenue"). The federal government creates money as I said. Some people call it "printing" money, although the government doesn't phyiscally print very much. Mostly it simply instructs banks, electronically or by check, to credit peoples' checking accounts. In addition to crediting peoples' checking accounts, federal spending creates what are called bank reserves which is what private banks use to back their customers' deposits. The upshot is that there is absolutely no need for the federal government to take out bank loans, run up credit card debt, or borrow in any way. Second is the Treasury's own misleading terminology. The Treasury sells Treasury securities in an amount roughly equal to the government's deficit spending. Why? Not to finance its spending, but simply because way back in the gold standard days Congress decreed that it must. The Treasury, for some inexplicable reason, refers to its sale of securities as "borrowing". The Treasury doesn't borrow the money spent on securities any more than a private bank borrows the money you deposit in a CD. And the Treasury does not spend the money it receives for the sale of securities. That money stays on account until time to redeem the security, at which time the Treasury just debits the purchaser's Treasury security account and instructs the purchaser's bank to credit his checking account by the same amount plus a little bit of newly created interest money. Now, here's the source of the confusion - China is one of the entities that buys Treasury securities. China has lots of dollars to invest because we buy so much stuff from China. China could stuff those dollars under its collective mattress, or it could, and does, invest them in US Treasury securities to safely park them and draw interest. That, my friends, is not lending. That is savings! Oh, by the way, that $18 trillion federal debt? None of that debt is money borrowed from a lender or charged on a credit card. By definition, the federal "debt" is the current amount of unredeemed Treasury securities. In other words, the amount people, companies, and countries have saved through the US Treasury. The $18 trillion in debt is more accurately described as $18 trillion in private savings. So, I rest my case. The United States does not borrow from China, or from anyone else, because it has no need to. I've been asked, "Why did you write about Gatlin?" The short answer is because nobody else has. There are myriad biographies about other Civil War generals, North and South, but none about Gatlin, so I figured somebody should write one. However, there is more to it than just that. Back in 1999 I ran across a thumbnail sketch of Confederate general Richard Caswell Gatlin in a one-volume Civil War encyclopedia and was surprised to read that he was from Kinston and Lenoir County where I now live and where some of my family lines go way back to colonial days. Naturally, I became curious about him, but there was no biography and no one around here had even heard of him. Geez, I thought, that's just not right. So my search for R. C. Gatlin began. Most of what I found over the years I had to dig out a sentence at a time. Incessant internet searches yielded precious little, a snippet here, a piece there, but nothing longer than two or three paragraphs. I bought all the books I could find and afford on the Black Hawk War, the Indian Territory, the Seminole Wars, the Mexican War, and surprisingly, for I had never heard of it, the Utah War; and, of course, the Civil War. Gatlin's West Point classmates and his fellow 7th Infantry officers were fodder for authors and some of those mentioned Gatlin. Over the years, I have come to know Gatlin better than probably anyone else alive today, although Gatlin's personal life before and after his military career still presents some unresolved challenges for me. These days, in the aftermath of tobacco's demise and the disappearance of the textile industry, Kinston and Lenoir County are trying to rebuild their image and economy. A large part of that rebuild centers around Kinston's Civil War experience. Kinston was impacted big time by the Civil War. After the town of New Bern fell and the North Carolina coast was lost to the Yankees, Kinston became the front line of the Confederacy. Then twice in the late 1800s the court houses burned and most of Kinston's early records were lost, along with memories of its history. As its native son, its lifelong sterling ambassador, and its only Confederate general, Gatlin's legend today belongs to Kinston and Lenoir County. I had to get his story into the infosphere. There must be a book about him, there certainly must be. And now there is.